I love glitter! And with three girls that love it also means my husband loves it also…..just kidding. He despises glitter;). 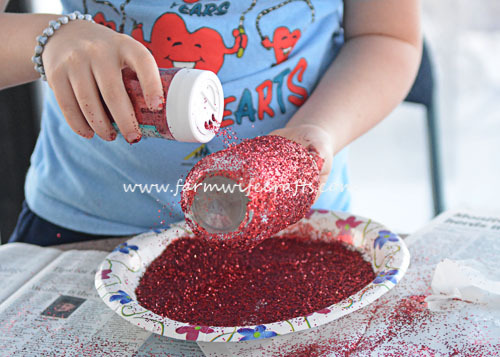 When we use it for a craft, we are usually still finding glitter in every little nook and cranny of our house! 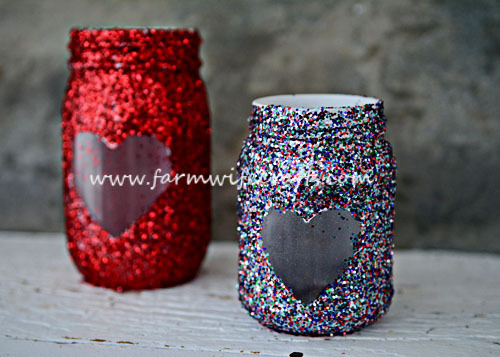 These DIY Heart Mason Jars are easy to make and add the perfect glittery touch to our Valentine’s decor. For this project you will need: rubbing alcohol, cotton ball, a jar of any shape or size (I used an old pickle jar and pizza sauce jar. 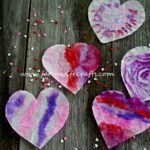 ), white spray paint for glass, mod podge, vinyl or a heart sticker and painter’s tape, glitter, paint brush, and clear acrylic sealer. First, clean your jar with a cotton ball soaked in rubbing alcohol and allow to dry. 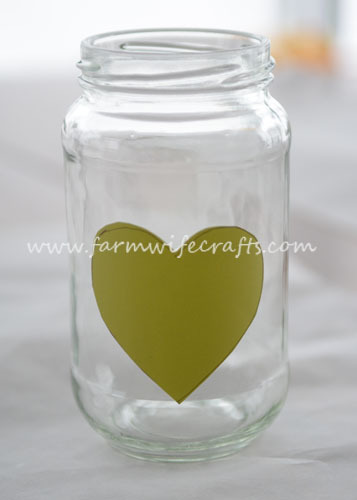 While the jar is drying, cut a heart shape from the vinyl. (I printed one from the computer and traced it onto the vinyl.) If you don’t have any vinyl, then add painters tape to the back of a sticker and trim the edges. Once the jar is completely dry, add the vinyl or sticker. Spray the jar with white spray paint and allow the paint to dry. I forgot to take a picture! 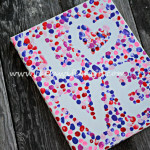 Next, add a coat of Mod Podge. Surprise, surprise, I forgot to take a picture of this step also, but make sure the jar is completely covered. Now, it’s time to add the glitter! 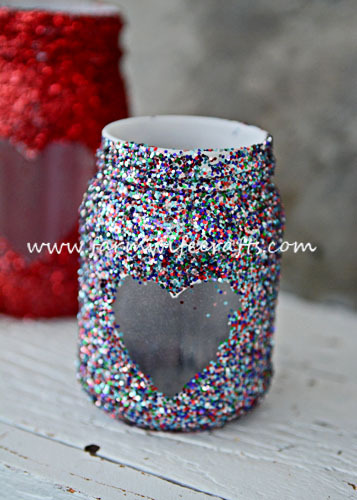 Shake off the excess glitter and allow the jar to dry for about 24 hours. 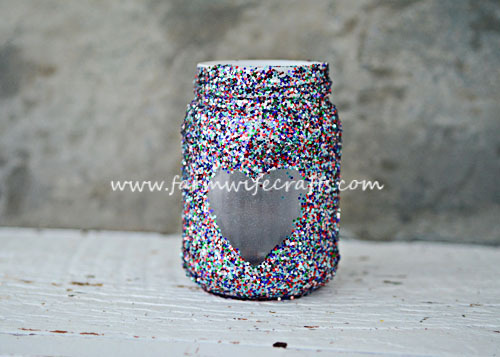 Spray the jar with clear acrylic sealer to help minimize the amount of glitter that flakes off. Let the acrylic sealer dry for about 12 hours, or until it’s no longer sticky to the touch. Now your jars are ready to display! I placed a battery operated tea light in my jars and love the warmth that they add to the room. So easy, yet so pretty. 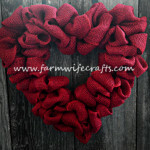 These would also make perfect Valentine’s gifts. 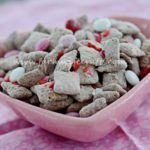 Just fill them with a favorite candy or treat, or simply add a card and some ribbon to the rim. Clean the jar using a cotton ball soaked in rubbing alcohol. 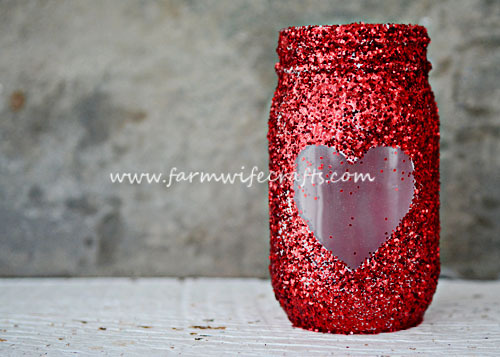 Once the jar is dry, add the heart. Spray with white spray paint and allow to dry. 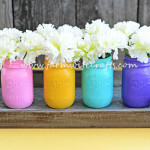 Using a paint brush, cover the jar with Mod Podge. 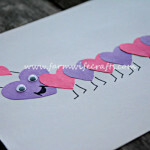 Sprinkle the glitter over the Mod Podge and shake off the excess. Allow the jar to dry for about 24 hours. Spray the jar with clear acrylic sealer and let dry for about 12 hours or until no longer sticky to the touch.